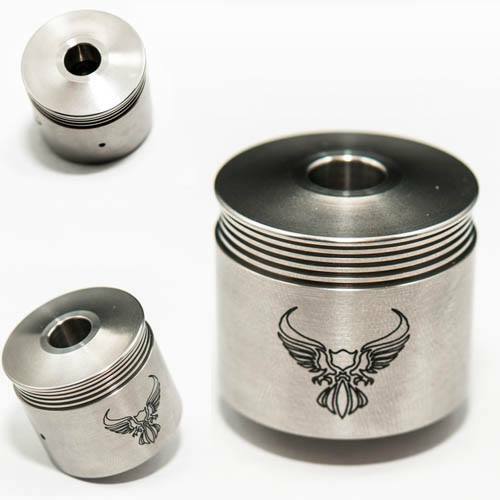 Authentic Innovape Mods Patriot RDA's! High volume tank equals higher air flow for larger vapor clouds; more room for wick equals more juice for more hits. Measures 22mm for a flush look on most mods. Zero resistance press fit terminal posts keep the power constant on every hit. Unique dynamic quad ring seal keeps any extra juice inside the tank. Through hole terminal design guarantees positive multi-point electrical contact to deliver maximum current to the coils. Dual o-ring design adds mechanical stability to tank and drip tip while keeping the air stream on the coils where you want it to maximize the vape. Unique heat sink fin gives it that custom look and design and also removes up to 50% more heat during a chain vape.